Stainless steel is widely used in surgical medicine: for medical devices such coronary stents, hip-implant stems and spinal-disc replacements, and for a variety of surgical tools such as scalpels and forceps, as well as operating tables. As a material, however, stainless steel isn't without its flaws. Over time, steel implants can cause allergic and toxic reactions and be rejected by the body, and in less hygienic surgical environments steel may not adequately resist the buildup of harmful bacteria. For years, scientists have experimented with ways to improve the efficacy of stainless steel using special coatings, modifying the material's chemistry and even molecular surface structure. While these approaches have generated improvements, they are complex and have a number of inherent limitations. To date, no effective, simple, cost-effective solution has been developed. But now, building on their expertise with other biomedically-relevant metals, scientists at Université de Montréal's Faculty of Dental Medicine, along with a colleague from the Department of Chemistry, have found a way to change the very surface of stainless steel by creating a nanoscale network of pores. The development – which could have widespread applications in medical and other manufacturing – promises to improve the acceptance of stainless steel by the body and help control bacterial infections in hospital settings. The research is detailed in a study published in the journal Colloids and Surfaces B: Biointerfaces. "The beauty of it is its simplicity and capacity to simultaneously improve cellular response and limit bacterial expansion," said the study's supervisor, Antonio Nanci, an anatomist in cell biology who runs the Laboratory for the Study of Calcified Tissues and Biomaterials. "In terms of its anti-bacterial advantages, there is no need for antibiotics, no need for chemicals; it works just by physical-chemical interaction between the steel and the bacteria – that's very unique and exciting, and it may represent another tool to help fight bacterial resistance to antibiotics," Nanci said. "Everything that's stainless in a hospital – the doorknobs, the instruments, the operating table – could be treated this way. With it, bacteria simply don't propagate." 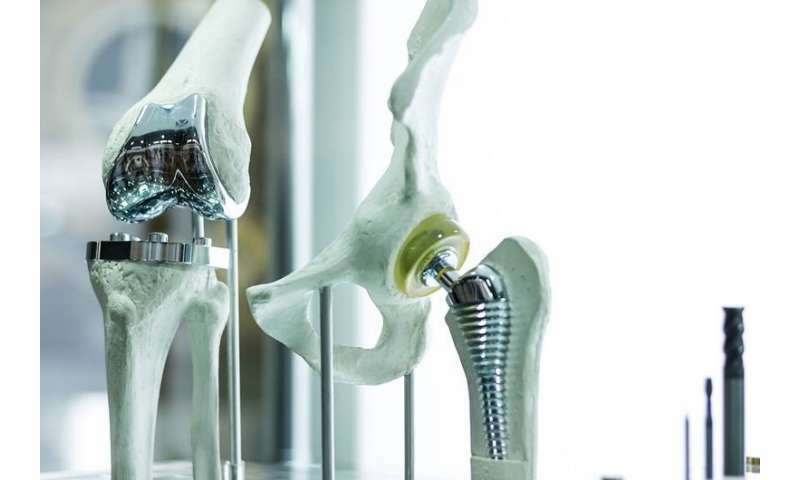 As for medical implants, "stainless steel whose surface has been altered will have the medical capacity to improve healing around implants and their acceptance by the body," Nanci added. This research benefited from the expertise of Alejandra Rodriguez-Contreras, a postdoctoral fellow from Barcelona working on ways to make surfaces antibacterial, usually a complex and painstaking process. "Alejandra didn't think it could be done simply on stainless steel, but one day she tried it and it did," Nanci recalled. "She ran into my office and said, 'It works! It works!'" The Spanish scientist adapted a process for electroplating metals using an unconventional chemical mixture. Also, she took the unusual step of using nail polish to protect part of the test sample during treatment, essentially creating an internal control that limits experimental variation. "Basically, we took the simple methods we developed for titanium in dental implants and adapted them to stainless steel, and it works very well," said Nanci. "Stainless steel is very resistant to chemical treatment, and a lot of people have tried over the years to make the surface functional. It's a tough material to deal with. But we've pierced the problem." Nanci believes that the process that his group had developed to change the surface of metal – which he calls nanocavitation – has medical relevance but may also find applications in other industries – for instance, to improve resistance to friction, to aid adhesion of protective coatings and paints, and to treat fermentation vats for food and beverages such as beer.